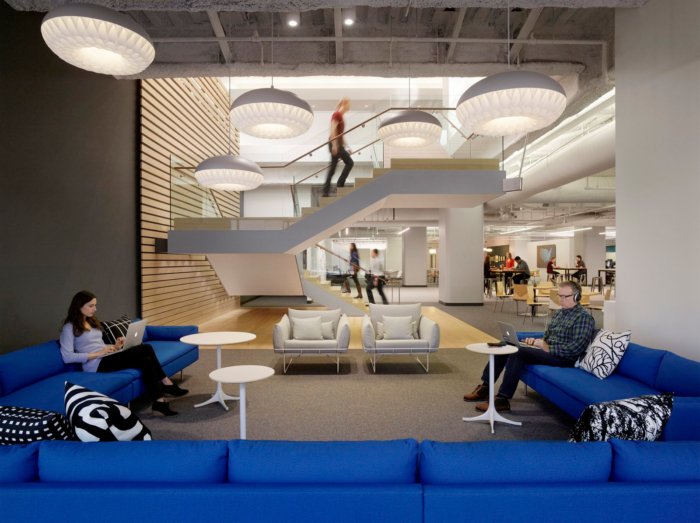 Bohlin Cywinski Jackson designed and completed the headquarters of credit card processing company Square, located in San Francisco, California. Square’s mission is to make commerce easy for thousands of small business owners and their customers. The company’s ethos is reflected in every detail of their software and hardware products, with a crisp, minimalist design that is both intuitive and elegant. 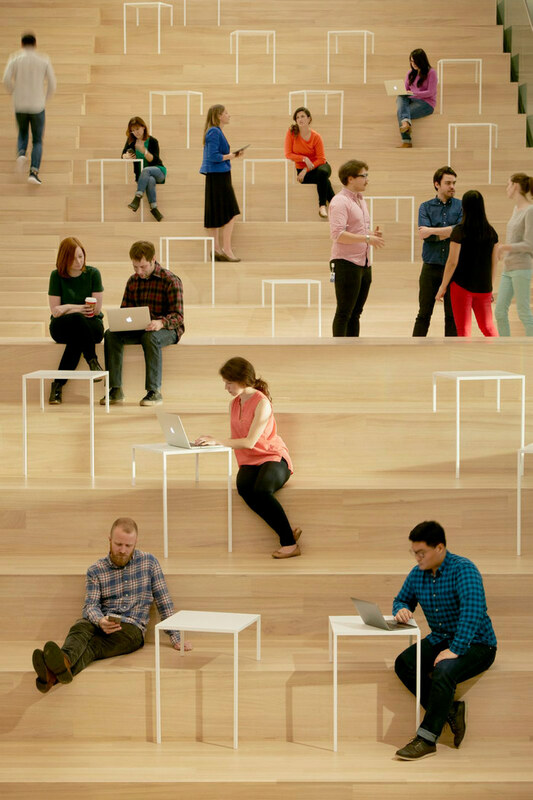 When Square approached us to design their new San Francisco Headquarters, we arrived at several fundamental objectives: to foster an open, fully transparent corporate culture in keeping with their start-up roots; to flexibly accommodate the company’s growth through clear and intuitive workplace organization; and to complement the company’s brand through careful consideration of architectural detail. 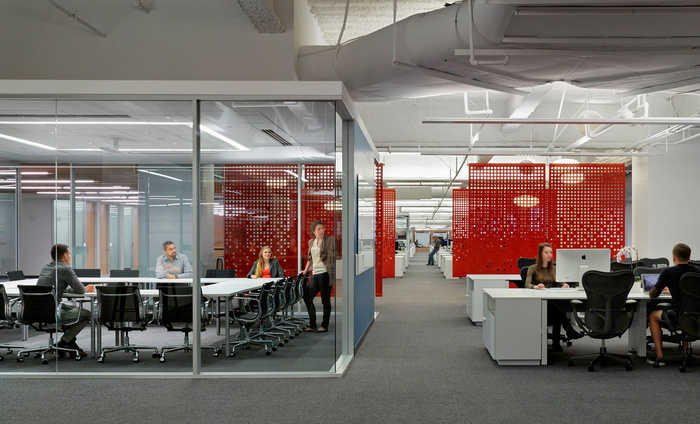 The design transforms a former Bank of America data center—which was undistinguished, windowless, and never designed for office use—into a first class workspace. Constructed in two phases, the project encompasses nearly 300,000-square-feet of space distributed over four floors. 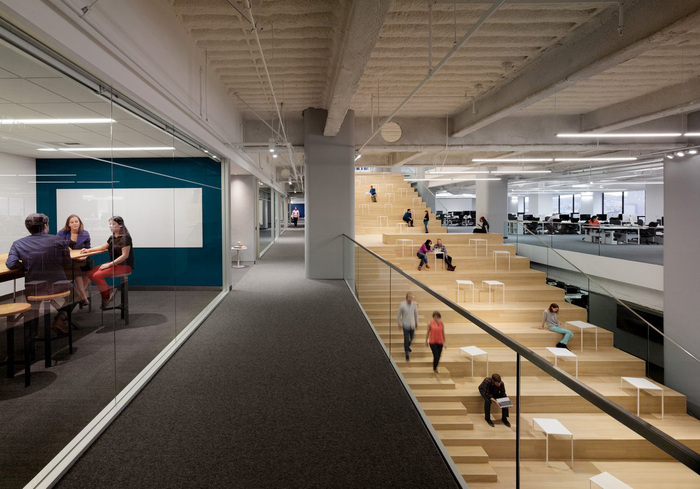 The large 100,000-square-foot floor plates, which allow many employees close proximity to one another, also pose a challenge to organizing space in a comprehensible way. This challenge was addressed by designing a workplace that relies on principles of urban design; by taking cues from cities such as Dubrovnik and Savannah, the design establishes clear circulation routes with visual landmarks that break down the scale of these vast floor plates. A central boulevard serves as the organizational spine for the office floors. Lined with communal tables and cabanas, and punctuated by “civic” landmarks—including a library, gallery, and cafe—the boulevard functions as a primary hub for team collaboration and social interaction. Along the boulevard, a delicatessen and coffee bar each provide unique dining alternatives to the company’s full-service restaurant. Operated by local Square merchants, Andytown Coffee Roasters and Wise Sons Delicatessen, these spaces also serve as in-house testing ground for the company’s latest product developments. 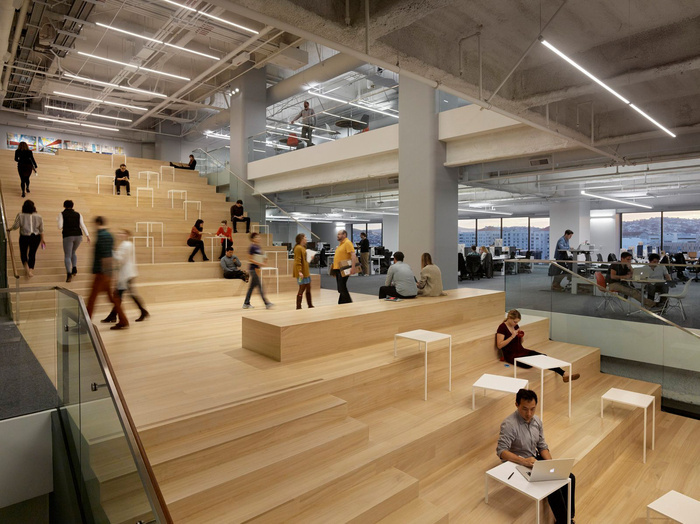 Anchoring the boulevard, a monumental amphitheater stair unifies the office floors and provides a flexible venue for a host of activities, from individual focus to large presentations. Custom white square tables support these activities while also providing a delicate sculptural counterpoint to the grand gesture of the stair. On the eighth floor, a more intimately scaled ‘Square Stair’ connects the office floor to the main dining level. By connecting all four floors along this central boulevard, the design encourages chance encounters and generates vitality comparable to the urban marketplace the company serves. The project’s clean lines and predominantly white interiors are a reflection of Square’s visual identity. In open areas, the exposed steel structure is painted white to reflect as much daylight as possible into the deep floor plates. Natural wood elements, detailed with locally salvaged eucalyptus and bamboo plywood, provide visual interest in the common spaces. Color is applied selectively to demarcate key landmarks and evoke the bay area locale; international orange and pacific blue are used as the two primary accent hues. The resulting palette is a timeless expression of modern design that resonates with Square’s brand identity.